While many businesses, and perhaps especially family businesses, can claim an interesting history, there can be few which can boast as rich and varied a past as Bryson’s in Magherafelt. 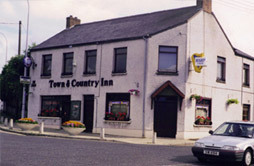 Bryson’s started out life as the Fountain Hotel in 1864. It was originally owned by the Salter’s company and leased to a Mr. Thomas Booth for the princely sum of £4.00 a year. As far as it has been possible to trace the licence, it then passed to the stewardship of Mr. John Piggott in 1884, followed by Pat O’Kane in 1901. The Bryson’s licence spent a brief spell in the hands of someone known to history only as Miss Glass until 1916, before being acquired by Pat Murray. Mr Murray has the rare honour of having owned the winning horse in the 1924 Grand National, Master Robert, before selling it to its more esteemed owners, Lord Airlie and Major Green. Mr Murray sold the bar to Miss Meighan (or Meehan, we cannot be sure) in 1927. The bar took its first step towards becoming the Bryson’s we are familiar with today in 1939 when it was bought from Miss Meighan by Patrick J Bryson, father of current proprietor Peter, 3 weeks after the outbreak of World War II. This year it celebrated its 70th year in the ownership of the Bryson family. It now resides in the capable hands of the husband and wife team of Peter and Patricia, who, together with their eldest son Niall, divide the work load between them. The other three Bryson children are also often to be found lending a hand in one of the four bars, and it is perhaps this personal touch and reassuring consistency which has made Bryson’s such a success with the local community. 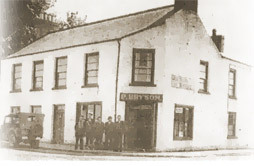 Bryson’s extensive new premises has come a long way from its humble beginnings as a small community bar, often frequented by visiting American soldiers during the Second World War. It was in 1972 that the Bryson’s legacy passed to its current custodian, Patrick’s son, Peter Bryson. While continuing in his father’s footsteps for the first few years, it was in 1982 that Peter with his wife Patricia, set about stamping their own image on the Bryson’s brand, and opened two important new chapters in the bar’s history, with a new extension serving as the foundation for both live music and hearty, traditional food. However, few could have predicted how successful these two ventures would prove to be, with Patricia building up an impressive reputation for great quality, locally sourced, home-cooked food that continues to this day. It would be this, along with the top local and international live acts which were now flocking to play there on a weekly basis which would lead to Bryson’s being named 1987’s County Derry Bar of the Year. Through the 1990s and into the new millennium, Bryson’s attracted such top names in live music as Henry McCullough, Four Men and a Dog, Garth Hudson, Kieran Goss, Frances Black, The Revs, Hal Ketchum, and others who are regrettably too numerous to mention, as well as nurturing young talent, helping promising new acts such as General Fiasco cut their teeth. As well as music and food, Bryson’s has always had a firm reputation for supporting local sport, playing host to many successful darts teams, and sponsoring a successful, but sadly short-lived local football team, Crescent Villa in the 1980s. A history of supporting the local rugby club, Rainey Old Boys, and Gaelic Athletic Club, Magherafelt O’Donovan Rossa, has ensured that sportsmen and sports enthusiasts of every discipline are a common sight in the bar, and guarantees that the atmosphere for live sporting events is truly second to none. 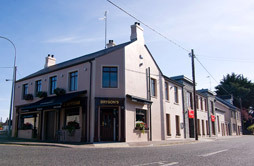 But in a changing market-place, the Bryson’s brand had begun to outgrow its humble 100 capacity home, and so, with the assurance of the family’s support, and the commitment of eldest son Niall full-time to the project, the decision was made to undergo a radical refurbishment to bring Bryson’s firmly into its 3rd century, and 3rd generation. The traditional Bryson’s lunch is now available 7 days a week, and with the addition of a more contemporary evening menu, the already sterling reputation for food which has been garnered over nearly 30 years can only continue to grow. Add to this the vibrant live music scene which continues to frequent the bar, and the top local and international DJs who are making Bryson’s a new must play venue, and it is clear that the Bryson’s legacy is in good hands.